Don’t let the dimples fool you. This kid is as tricky as he is cute. Here he is painting in the driveway. I was going back over my old posts and realized I haven’t made much mention of our four-year-old son Luke. He is and always will be, the epitome of the middle child exemplified here again by how infrequently I’ve written about him. But make no mistake, I love him so much it hurts. He is my only snuggle bug. He gets upset when the other two kids are sad about something and has cried real tears when Gracie has fallen down and gotten boo-boos. He is also the one with the quick wit, jealousy issues, a stubborn streak that seems unassuming until you hit a nerve and then watch out! He comes across like this quirky little goofball, but I am beginning to see that Luke is not to be messed with. As I have described our son Noah, it probably seems fairly obvious that while he is a very loving child and generally considerate older brother, he can also be very overbearing. There have been many occasions where I have been worried that Luke won’t be able to hold his own. But my concern is futile and the following story will illustrate that. A few days ago, we were visiting my parents. My sister and her son Joey were also over for the afternoon. After we had all eaten lunch, my sister was trying to get Joey to take a nap upstairs.The boys were being loud and crazy downstairs making it impossible for her to get him to settle down. So I suggested to my boys that we go downtown to the bakery to get a cookie. Luke was excited to get out for an adventure. Plus, he loves the cookies at the local bakery so he was an easy sell. I asked Noah to come with us, but he wanted to stay at Pops and Lulu’s house. Still, he was pestering me to bring him back a cookie. I told him he had to come with us if he wanted one. I was doing my best to bribe them to come out so Joey could get to sleep. Noah refused after throwing a temper tantrum so Luke and I left. At the bakery, Luke sat in his chair on his knees and ate his dinosaur sugar cookie. He smiled his big goofy grin at me between bites. Then I saw his eyebrows turn up as he formulated a question. I waited for it. Luke usually takes a bit to get to the point. “Can we play a trick on Noah?” he asked me. I laughed. I couldn’t believe my ears. My sweet, innocent Luke was plotting a scheme. “What were you thinking about?” I asked breaking off a piece of his cookie to sample. “What?” he asked smiling wickedly. “He’s going to say, ‘Hmpf! I don’t love you anymore!’” I said, imitating Noah’s whine perfectly. This sent me into hysterics. He laughed again too, thinking probably that I was laughing at how Noah would react, not at his sneaky little scheme. So we got back to my parent’s house. Noah was zoned out watching a cartoon with my mom, my sister, Gracie and Joey. All was quiet. Luke looked up at me. “Tell him, mama,” he whispered. “This was your idea. You say it,” I whispered back. Luke was losing his nerve a bit, but I could tell he was still dying to do it. While Noah sat unaware and watched his cartoon, I quietly told my sister and my mom about Luke’s plot. They giggled softly not believing Luke had hatched this plan on his own. I positioned myself between Noah and Luke on the couch to buffer the inevitable retaliation. Finally, Luke spoke up, “Noah,” he said sweetly. Noah looked at Luke, giving him a dirty look. “What?” he said. He was still mad that we had left without agreeing to buy him a treat. “Noah, Mommy got you a treat at the bakery,” Luke said slowly with a twisted smile spreading across his face. “Yep!” Luke was wiggling all over the couch trying to contain his delight. “YAY!” Noah bounced on his bottom. “Where is it, Mom?” he asked. Then almost exactly as I’d predicted Noah said, “Hmpf! I don’t love you anymore!” Then Noah looked right at ME and started swatting my arm repeatedly. Luke was rolling but also scooted quickly over to my mom for further protection from the wrath of Noah. He had bested both of us! I couldn’t believe it! It was like he knew I would be the one to be punished for his wicked little scheme. It is foolish of me to think Luke is ever going to get trampled by Noah’s big personality. Now I know, I should underestimated ever again. They really do love each other…most of the time. The room stood still for a small eternity. Two. Two heartbeats. Two…babies? “Two babies?” I looked at the doctor wondering if this was a practical joke she played on new mothers. Surely there couldn’t be two babies in there. But she nodded smiling and reassured me that it was real. I started crying feeling completely overwhelmed, overjoyed, but mostly scared. I felt so inadequate and unprepared. She handed me about twenty-five tissues to wipe my eyes and nose as the news washed over me again and again. Why hadn’t I insisted Scott come with me to that appointment? I was completely alone absorbing the news that we- no, I– was going to be having twins. As I drove back to work that gray February day, with the ultrasound pictures in my purse, I kept pulling them out trying to get my brain around how this was even possible. Scott and I had been trying for nine months to get pregnant. We’d had a miscarriage the previous July. We had been trying for one baby, not two. But there they were. Big blip and little blip. I called him about halfway back to work when I thought I could tell him without bursting into tears again. We went to several appointments early on. Dr. Matoian was treating it like a high-risk pregnancy because of my previous miscarriage and the fact that it was twins. For about four weeks, Scott and I started talking about names. We planned where the babies would sleep. Would we put them together or in separate rooms? We were terrified but also felt so special to be having two babies at once. I battled some nasty morning sickness early on but was relieved to have it. After all, it meant I was still pregnant. I was always worried about losing them since the miscarriage. I just couldn’t get used to the idea that I’d get to keep them. I cried again. She handed me about thirty-five tissues. I’d lost Tiny. One baby. There would only be one baby. Bubba. So I drove to Scott’s office again and told him that Bubba would be our only baby. We both cried. But we resolved to be thankful that at least we got to keep one. We’d still get to keep one, or so I hoped. I worried the entire pregnancy that I was going to lose him. Then in spite of my fears, Bubba, or Baby T, was officially called “Noah James” on October 21, 2008. He was an emergency c-section delivery after many hours of labor. He wasn’t progressing because he was stuck in a position which could have crushed his windpipe. So instead of meeting him in labor and delivery, we met him in the operating room. I was scared out of my mind. Was today going to be the day I would lose my baby? But No. Noah came charging into the world. He had a good strong cry. I fell in love with his old man face instantly. I knew when I held him, he was going to be like me; stubborn and moody, but when he was quiet and stared at me, I could see his depth. He was, and still is, full of life and tenderness. All of this is so fresh in my mind and my heart. It doesn’t seem possible that today, I spoke to his kindergarten teacher about the upcoming school year. How could that little mesh-capped, swaddled baby boy possibly have his first wiggly tooth? How is that baby already swimming without a life jacket and riding a bike without training wheels? I remember when he was still all curled up and his feet wouldn’t even stay in his footed pajamas. That can’t be the same kid, can it? But then I know it must be because he has the same laugh; the laugh that makes everyone else laugh. He has the same crooked toes. He has the same long, curly eyelashes. He’s just far less vulnerable. But finally, I’m starting to learn, we should be getting the world ready for Noah. He has such a strong spirit. His capacity for empathy is so deep. He is a natural leader. He is honest- he tattles on himself constantly! He is brave. I am so proud of my Noah. So, I hope the world is ready for my son. Because he is ready and here to stay! 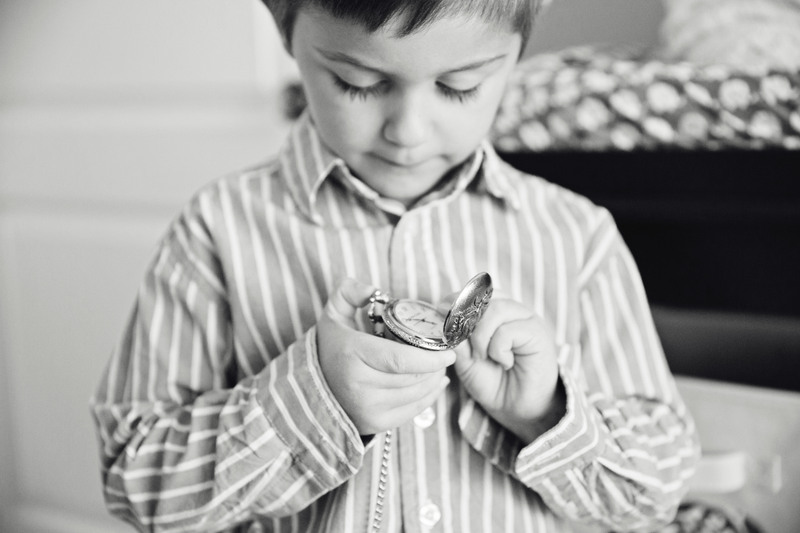 Noah with his pocket watch from his Papa (Scott’s Dad). I mean, really though, check out those eyelashes! I don’t mean to be this way. It’s just how I am wired. He has told me I can lift him up with my words, but I can use them as my weapon against him when my back is to the wall. I am an extremely passionate person but I also have a short fuse. I’d venture to say that this paradox is true of most people; our best qualities are often our faults. He’s had to deal with me for the past ten years, eight of which we’ve been married. I applaud him for putting up with me. I know I am not easy to live with. But to be fair, he can be challenging too. Scott’s strong points are his determination and his ability to achieve almost anything he puts his mind to. He works hard to succeed at everything he does. He doesn’t look for approval from anyone. But sometimes it leaves me feeling railroaded. When he’s on a mission to accomplish something, I sarcastically refer to it as, “The Scott Show,” where the kids and I are just supporting actors. I know that’s harsh. But it’s our reality at times. Every marriage has it’s challenges and I am just opening up and sharing a few of ours. To all of my unmarried friends, I will never lie to you and say marriage is easy. But you probably know that already when you see how many marriages end up failing. If it were easy, people would stay together and in love forever. I don’t stay with Scott because it’s easy nor do I expect it to be. In truth, our fights (and we’ve had some doozies) have made us stronger both as a couple and individually. It’s like two rocks rolling down a hill together and when they bump into each other, they help chip off one another’s rough edges. We become more refined. It has helped us to have a sense of humor about ourselves. As I mentioned, we’re celebrating our eight year wedding anniversary on Monday, August eighteenth. 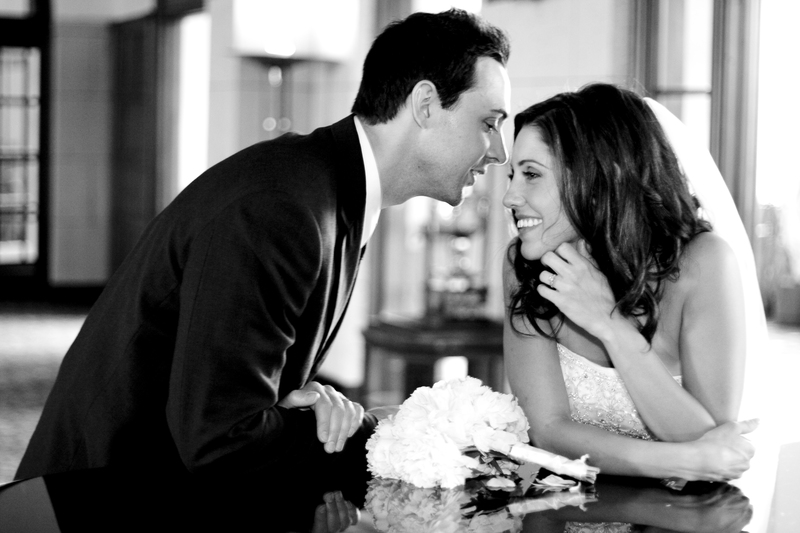 I look back at my wedding pictures and I remember the day better than “just a blur” as many people describe it. I look at that young girl with her meticulously styled hair, looking confident in her beautiful wedding dress. Her cheeks are sore from smiling and her heart is full of hope and expectations. I want to sit her down and tell her, “That hope and that love you feel today are going to be tested. But don’t give up. Every challenge will be replaced with strength once you overcome it. Some days you are going to want to leave. You will think you are going to be better for it if you do. But don’t. You will miss out on a really amazing life if you do.” But I probably would have rolled my eyes at myself and said, “Ok, I’ll keep that in mind, Mrs. Know-It-All,” because we never fully appreciate what well-meaning people are trying to tell us until we go through it ourselves. So you can take or leave the advice I am about to dispense. It is, after all, just my opinion based on my meanderings of my life. I know sometimes a marriage falls apart because of things beyond control. I have seen people split apart by abuse, addiction, or by the loss of a child; things that I pray I never have to experience. I don’t know what I would do and I won’t pretend to be any sort of an authority on such matters. But our journey is determined by the choices we make with the required courses in which life enrolls us. We don’t always get to “choose our own adventure.” And some of those choices we make when we’re tossed into those tough courses lead to some frighteningly permanent circumstances. The one that terrifies me most is losing this guy I promised to love forever or breaking the hearts of my children because I need to find something I believe I can’t by being with their daddy. Thankfully, any thoughts I’ve had doubting this life are fleeting. And once they pass, I find out something about myself more profound than what I thought I was missing. Every time. Sometimes it takes a bit, but there is always light after the dark if you’re willing to wait for it. So yeah, our eight years may look a little different than other couples’. Maybe we fight more. Maybe we fight less. Maybe there are a few more dents in the walls from shoes or my phone being chucked in Scott’s direction during one of our epic battles (Sorry, honey. At least I have terrible aim). Maybe we don’t go on as many date nights as some people do. Or maybe we make other couple’s social lives look pretty lame because of how much we do together. I don’t know. It’s really not a contest. I do know that I don’t regret a minute of it and I am thankful that he’s still willing to call me his Sour Patch Kid. Happy Anniversary, Scott. I’m glad we decided to take this class together. P.S. It’s been eight years! Does that make us Doctors?